When I took up my first role in NHS libraries as a graduate I had only a peripheral sense of the work of library and knowledge professionals working in healthcare. Little did I know how critical it is that knowledge is mobilised effectively in the NHS, not least that there is a network of library and knowledge professionals spanning the entire country, supporting the health system from top to bottom. My 15 years’ experience of working in library and knowledge teams in the NHS has allowed me to see how effective knowledge management behaviours can enhance the health system at all levels. The NHS is a constantly evolving system, operating in a shifting political landscape. It’s crucial that healthcare practitioners and systems have access to the best knowledge they need to perform optimally. However, what is meant by knowledge might differ depending on your context. Since joining the Knowledge Management team in NHS RightCare, one thing that has struck me is the value of tacit knowledge (meaning the intuitive, hard to define knowledge that is largely experience-based). At a Clinical Commissioning Group level, for example, you might have a good understanding of the evidence base in a particular clinical area, but you might still need to know how best to apply this evidence in a health care system. In this instance, the knowledge that you need might not be found in published evidence, but needs to be captured by asking colleagues in other parts of the country: “Who has already done this? What works well? What are the challenges?”. As a KM team this is something we’re always exploring, as well as understanding how we might harness technology to connect people and ideas. At the same time, library and knowledge professionals are working on the frontline of the NHS, helping to enhance patient care by supporting health care practitioners to find, assess and apply evidence effectively. While in an acute hospital, I saw how library services can support individuals to progress academically, help teams to make evidence-based decisions, and enable patients and visitors to feel empowered in the decisions about their treatment. In my six years as clinical librarian, I provided evidence and knowledge support as a member of the multidisciplinary team; this model of ‘embedded librarianship’ permitted me a fascinating insight into the ways that clinical teams access, digest and apply evidence in a fast-paced, pressurised clinical environment. A 2016 systematic review highlights how embedded librarians contribute to a wide range of outcomes including choice of intervention (36%); diagnosis (26%); quality of life (25%); increased patient involvement in decision making (26%); and cost savings and risk management including avoiding tests, referrals, readmissions and reducing length of stay (28%). It’s an approach that many library and knowledge services adopt across the world and in England it’s a key priority in the Knowledge for Healthcare development framework. Thanks to the fast-paced and changing nature of the NHS, the amount of new research published each year, and the wealth of information available online, it’s easy to see how library and knowledge professionals are often described as ‘knowledge brokers’. We are perfectly placed to act as a conduit between the world of information and the healthcare system, endeavouring to ensure that only evidence that is high quality, reliable and meaningful is applied in practice. One area in which NHS library and knowledge professionals are able to bridge such a ‘knowledge gap’ is for the individual receiving healthcare treatment and their family. One of the barriers that a patient or family member may need to overcome is having the appropriate skills, knowledge, understanding and confidence to access, understand, evaluate, use and navigate health and social care information and services, a concept known as health literacy (Public Health England, 2015). Many NHS library and knowledge services are partnering with public libraries and other community organisations to improve health literacy in their local population, or are contributing to the production of evidence-based patient information in their own Trusts. Library and knowledge services are also well-placed to promote optimal knowledge management behaviours. One way that the NHS RightCare Knowledge Management team does this is by encouraging colleagues to reflect and learn after a project has been completed. By facilitating an After Action Review with a team, we can begin to understand what worked well and what could have been improved, and use this learning to capture actions and recommendations for next time. In this way, we are helping to cultivate a questioning and learning culture across the organisation. So, whatever part of the NHS you work in, it’s likely that you won’t be too far away from a library and knowledge professional – seek them out and discover how they can work with your team to improve patient care through the power of knowledge. 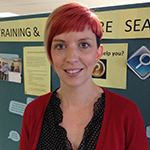 Victoria Treadway, MA, MCLIP, has worked in NHS library and knowledge services since 2004, working alongside healthcare professionals and teams to understand their knowledge requirements and deliver accessible and responsive library and knowledge services. She is currently Knowledge Management Facilitator at NHS RightCare. Victoria is undertaking research to explore the role of the embedded librarian in supporting healthcare professionals, patients and families in Critical Care. Her professional interests include informal networks (such as communities of practice) and demonstrating the impact of library and knowledge services.